Nearly three dozen dogs were rescued Thursday from woeful conditions in a Scotts Valley home, according to the Santa Cruz County Animal Shelter. The rescue happened after someone reported that several dogs were suffering from "deplorable and inhumane" treatment at a residence. The animal shelter officers were familiar with the property since there have been similar complaints made in the past, the shelter wrote on Facebook. "The conditions were such that [the dogs] needed to be seized," Linda Puzziferro from the Santa Cruz County Animal Shelter said. "They were breeding the dogs, and there were many dogs. The conditions were not good." With the help of warrants and assistance from the Scotts Valley Police Department, the animal shelter retrieved 34 dogs. 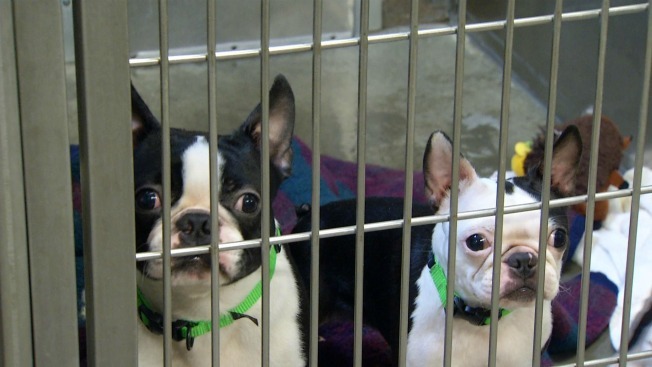 Most of the canines were Boston terriers, as well as some Tibetan spaniels and one Chihuahua mix. The pets were not being treated appropriately and will need to be examined by the veterinarians, according to the shelter. The dogs' owner struggles with hoarding problems and recently suffered a stroke, a man who lives on the property where the dogs were seized told NBC Bay Area. The man added that he understands there were too many dogs in one location, but claimed the pups were healthy. The shelter is stretched thin, officials said, and asked for donations. People looking for more information can find it online.